Here’s a great tip from the folks at my local garden centre, Shannons in Forest Hill. Ten days before you wish to harvest your potatoes, cut the top growth off (leaving a little stalk so you know where the spuds are when you come to dig them up!) 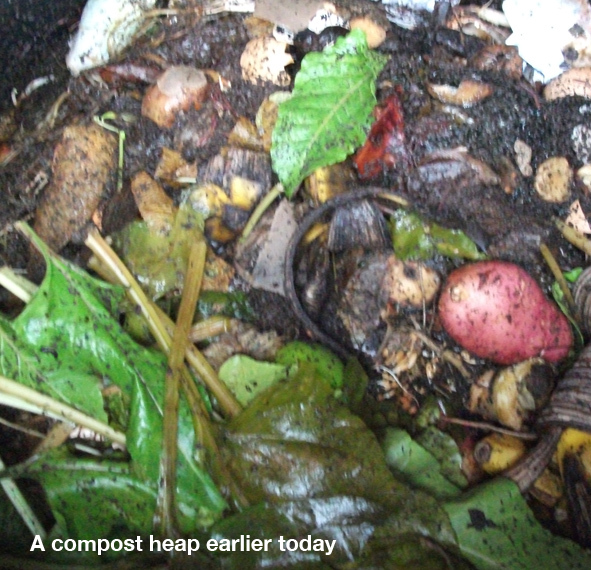 The plant will then put all it’s energy back into the tubers (ie. the potatoes) and give you better skins. I didn’t know that! The recording isn’t exactly hi-fi quality but it’s a great piece of reggae history on tape/MP3. Big up the late great D Brown! While I was writing this singing to the song on headphones, my 14 year old daughter came in very concerned and asked was I okay as I sounded “slightly high.” What, on a Thursday night on a glass of cheap Marks’ Sauvignon? I wish, It must be my bad singing! The garden is approaching the end of the growing season so now’s the time to put those hardy veg in to “overwinter” over the cold months and utilise your space to the max. The plants will make a start now, go dormant over the winter period then perk up in the spring, giving yourself a head start on the veg front next year. Vegetables like spring cabbage, kale, spinach, broad beans, peas, even lettuce (look out for a hardy variety like “artic king” at the garden centre) can be put in now for overwintering. 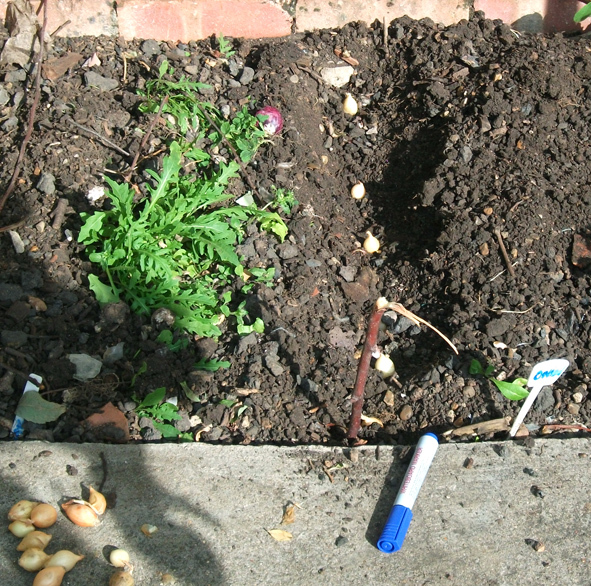 Last week I sowed some broad beans, onions and garlic. You can grow onions from seed but the most convenient way is to grow from “sets”, mini onions (think pickled onions in their skins!) that’ll save you time and effort. I got a bag of about 50/60 for £3, that’s well enough for yourself with loads left over to pass onto a gardening mate or two. I prepared the area as per, taking out weeds, stones etc and made two rows about 10″ apart. I then sowed each set 5″ apart and buried them with about a quarter of an inch of soil above the top of the set to stop the birds and squirrels from having them. Don’t use force pushing them in or you will damage the sets. All you have to do then is watch for weeds and damage due to wildlife trying to rob them off you (you could even put a net over them on their early days if you’re keen!) and wait. Do remember to stick in some sort of plant label as you might forget. I do it all the time, that’s why I have a squash plant growing up some canes like a cucumber at the moment! 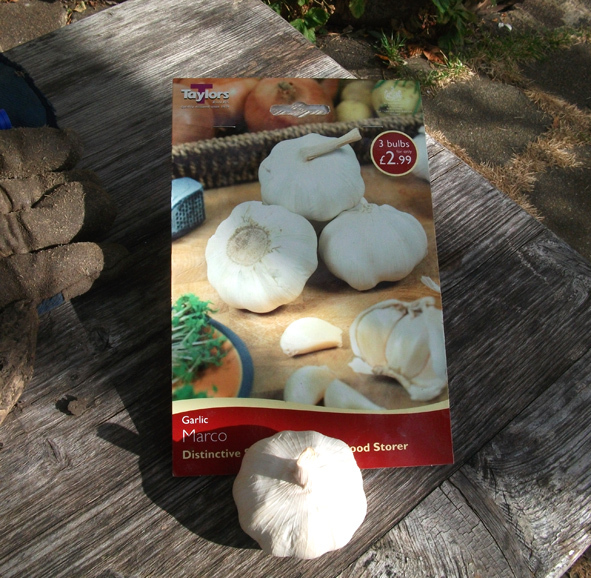 I’ve also started off some garlic. These are from a bulb not unlike the ones you use in cooking. Just carefully break it up and put the cloves in the ground instead of the pot. You don’t want to use any old one from the supermarket as you don’t know what variety it is and if it’s suited to you local climate so get especially for the plot from your garden centre. With planting just carefully put them in (flat end down) with about a quarter of an inch covering over the top so the birds can’t see them and space them about six inches apart. If you’re doing them in rows keep those about 10″ apart. There you go, how easy was that? * An Englebert Humperdinck song no less! Here’s a great mix from David Mancuso live at the loft from 2005. Some excellent tunes (with gaps between the records too) and one to stick on while in the garden. Seven hours of excellent tunage and it’s downloadable too! Found this bit of gardening kit on a skip the other day coming home from work. It ain’t exactly a top of the range watering can but it’ll come in handy next year for applying some liquid worm compost or the home-made smelly comfrey liquid to the garden. It would have been better if it was one of those antique metal watering cans but hey, beggars can’t be choosers. Using a term that a mate of mine (Hi Gord!) used this week, this green bit of plastic could be “an antique of the future”! 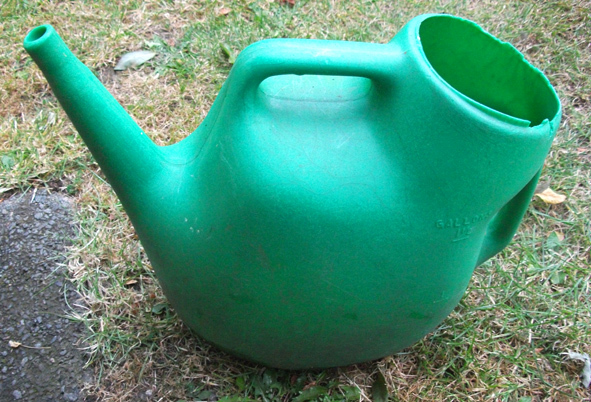 Big up all watering can and hosepipe massives! 3. A pair of old leather shoes. Ta for Scarlett for telling us about that! 4. An old cardigan in a Val Doonican stylee. Where were you in 2012? Last week I went to “Someday All the Adults Will Die!” (Punk Graphics 1971-1984), an exhibition and fanzine discussion at The Hayward Gallery here in London. I’ve always been interested in fanzines since doing one years ago, so thought I’d give it a go. Ta to Marc for the tip off. The discussion featured amongst others, Tony D from Ripped and Torn/Kill Your Pet Puppy fanzine and Gee Vaucher, creator of the bonkers graphics for the punk band Crass. Funnily enough I stayed off the beer on the night as I usually get a bit contrary at these events and give it all “Punk wasn’t about nostalgia” etc etc (yawn!). One of the highlights of the discussion was me and my mate (nice one Lee!) getting told off by the girl in front of us for whispering a couple of times through the talk. So much for Punk being about freedom, obviously not! Later on going around the exhibition I got a bit worked up as it featured a copy of Ripped and Torn 17 (All images on this post from that issue). “I’m in that, I’m in that” I excitedly said to my mate. Good job I didn’t have a drink beforehand as I wouldn’t been happy until I had got the staff to unscrew the Perspex panel there and then and take the fanzine down to show to my friend. Good job I didn’t, as looking at that Ripped and Torn again this morning I found the mention, very very small at the back of it in biro (below). Hardly stuff to get worked up about. But no whispering at punk discussions though!